MAR 16 – CONFESSION – 3:00 PM, DIVINE LITURGY – 4:00 PM; MAR 17: DIVINE LITURGY OF ST. BASAL: 10:00 AM, FASTING POTLUCK TO FOLLOW; MAR 19: 6TH HOUR & CATECHISM – 11:00 AM. The Gospel Reading for this Sunday is Mark 2: 1-12, Jesus Forgives and Heals a Paralyzed Man. The man on the mat was not able to walk. He had come to Jesus to be healed because he was certain that Jesus could heal him. But Jesus saw a need much greater than his paralyzed legs. He saw the man’s sinful heart. Because the men fully trusted Jesus, Jesus gave this man the greatest gift; it was the forgiveness of his sins. And when Jesus forgave the man’s sins, he became a part of God’s kingdom. It’s important to note that Jesus did not forgive the man because he and his friends had worked so hard to enter the home. No, this was just proof of the faith they had in Jesus. This crippled man knew that he was helpless to help himself. He put his trust in the only One who could heal him. Note the teachers did not understand what Jesus was saying because it was different than what they were used to and, therefore, accused him of blasphemy. The main point: Only Jesus can forgive our sins. 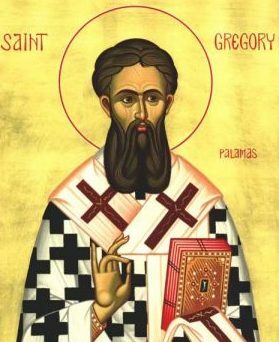 On the second Sunday of the Great Fast the memory of St. Gregory Palamas, a bishop of Thessalonica who lived in the fourteenth century, is celebrated. He battled against the distortions of the Christian faith by teaching the importance the power of the Grace of God. He also taught the importance of fasting and prayer, particularly the practice of reciting the Jesus Prayer according to the teachings of the hesychastic Fathers. Doing so prepares one to receive the grace-filled light of the Lord so that one can, therefore, partake of divine blessedness while still on this sinful earth. On March 17th we commemorate St. Patrick. Saint Patrick’s Day or the Feast of Saint Patrick is a cultural and religious holiday celebrated on March 17th for the most commonly recognized of the patron saints of Ireland. The day commemorates him, the arrival of Christianity in Ireland and the heritage and culture of the Irish in general. Little is known of his early life, except he was born in Roman Britain in the 4th century, into a wealthy Romano-British family. His father was a deacon and his grandfather a priest in the Christian church. At 16, he was kidnapped by Irish raiders and taken captive to Ireland as a slave somewhere on the west coast of Ireland. According to his Confession, he was told by God in a dream to flee from captivity to the coast, where he would board a ship and return to Britain. Upon returning, he quickly joined the Church in Auxerre in Gaul and studied to be a priest. 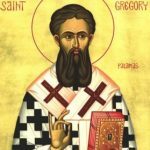 In 432, he again said that he was called back to Ireland, though as a bishop, to Christianise the Irish from their native polytheism. According to legend, Saint Patrick used the three-leaved shamrock to explain the Holy Trinity to Irish pagans. After nearly 30 years of evangelism, he died on 17 March 461, and according to tradition, was buried at Downpatrick.